"It's really a simple way to connect a Java application to a .Net application" using REST technologies, said Jean-Christophe Cimetiere, senior technical evangelist at Microsoft, in an interview. "So far, beside client toolkits for Microsoft technologies such as .Net and Silverlight, only the PHP language had an easy solution to interact with those services. Today, with the release of Restlet 2.0 M5, we are proud to announce a similar offer for Java developers, cleanly leveraging the Restlet Framework," said Jerome Louvel, of Noelios, in a blog. The technology is accessible at Restlet's Web page. Java developers use the extension's code generator to create Java classes that correspond to data entities exposed through ADO.Net Data Services," he said. "The Java application is then able to accesses the data via a simple method call. The runtime components in the Restlet engine and the extension take care of the communication between the Java client application and ADO.Net Data Services." He also cited several other interoperability projects to link Java to Microsoft, including Apache Stonehenge, for SOA and Web services interoperability; Azure .Net Services SDK for Java; and Eclipse Tools for Silverlight. 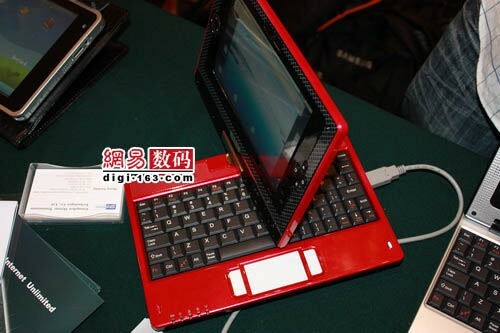 Still think an Android-based netbook is in your future? If the abysmal performance on video hasn't turned you off yet, maybe the fire-engine red paint job coupled with 90s-era carbon fiber accents will. What you see above is the first legitimate in the wild shot of Skytone's Alpha 680, and at a glance, we're marginally excited about the sizable trackpad and roomy keyboard. Oh, and the swiveling screen is a plus, too. Check the read link for a few more looks. Last weekend, we attended a web demo of Wolfram Alpha, a new "computational knowledge engine" based on the work of Stephen Wolfram. Some have dubbed Alpha a "Google killer," but, in reality, it is very different from the standard search engines that we are all familiar with today. When we got the demo, Wolfram asked us to refrain from publishing any screenshots. Today, however, the Berkman Center posted a video of the public demo Wolfram gave earlier this week, so we think it's only fair that we share our own screenshots with our readers at this point.